Financial year is about to end and you must be busy in doing tax planning or tax saving. 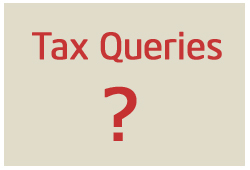 In order to help you out we are here with answer of your tax queries for FY 2013-14. (1) What is maximum limit of deduction that can be shown under section 80C, 80CCC, 80CCD, 80CCE? (2) What other tax saving option do I have apart from 80 C? 80 DD – Deduction on medical treatment and maintenance of handicapped dependent up to Rs. 50,000 for disability below 80% and Rs. 1,00,000 for disability above 80% is allowed. (3) I had invested Rs. 20,000/- in Infrastructure Bond & can I use it for tax saving ? Exemption “US 80CCF-INFRA BOND” is not available in FY 2013-14. (4) I have purchased a house in this financial year which is under construction. I have paid stamp duty & registration fees. Can I claim this amount under deduction? Stamp duty & Registration fees can be claimed by you under Section 80C → REPAY OF HSG LOAN(PRIN). Registration charges and stamp duty can be claimed in current financial year even if you have not got the house possession. You can also claim your Pre EMI, but only after getting possession of your house. (5) I have booked flat / purchased flat as a second co-owner of flat, EMI payment is going from first owner’s account, will I be eligible to get the tax benefit for Home loan repayment and interest payment? As per Income tax norms, if loan repayment & interest payment is not getting deducted from your bank account then you will not be eligible for any exemption against it. Only the first owner from whose bank account the deduction is happening will be eligible for exemptions. (6) Can I claim Interest on Housing loan upto Rs 250000/- on my existing loan as per section 80EE? (7) My Spouse is perusing higher education and I am paying those fees, so is it possible to avail tax benefit on that? YES, subject to you have taken Loan from financial institution, it is for higher education, & it is paid out of income chargeable to tax. (8) I have invested in Rajiv Gandhi Equity Savings Scheme, 2012. Can I claim the invested amount? Yes, Amount invested by you in RGESS can be claimed during filing of your personal Income tax returns. (9) I have received LTA amount in my salary but I have not travel any place can I claim it for deduction? Hope your query related to Tax is answered by me. If you have any other query or doubt related to income tax and tax saving do post your query in comment section.